The Miniature Pinscher, or "Min Pin," is a bold, proud, confident, fearless dog who is also highly curious and playful. He has endless, non-stop energy! He loves to chase, play with, and chew things. You will need to watch him carefully, because he sometimes steals and chews things he shouldn't, and can choke on small items if not supervised while playing. He is extremely curious, and will stand on his hind legs to make himself taller and see what is going on around him. He is a loving, lively dog who often bonds very strongly to one person. He is easily trained, and is a quick learner who genuinely seems to understand what you are commanding. He can be independent and defensive, however, and will nip at both children and adults if he is roughly trained or handled, or if he feels uncomfortable or threatened. He can get along well with a family and with children and other pets as long as he is socialized while still a puppy. He is difficult to housebreak. He is a deeply loyal and protective dog who makes a good watchdog. He is extremely alert and will bark loudly at anything that seems to present a danger, and will take a challenging stance to face it. He may bark too much at times. He is distant and aloof with strangers, and generally not friendly to people outside his family. Because he is so energetic, he needs lots exercise both inside and outside the home. He needs to play in safely fenced yard because he is quick to escape; he is known as the "Houdini of the dog world." When out walking he needs to be on a leash because he will chase after small animals or any small thing that moves. He can also be aggressive toward unfamiliar dogs. He needs to be protected from the cold in winter, and loves to nestle in a bed under a blanket. You need to watch his diet and exercise closely, as he can quickly become overweight. He is a low to moderate shedder--something to bear in mind if you don't want any dog-hair in the house. The Miniature Pinscher is 10 to 12 inches tall (to shoulders) and weighs 8 to 12 pounds. He had a short, smooth coat. His coat color can be red or a combination of two colors: black and red, black and tan, brown and red, brown and tan, or blue with tan or red, or fawn with tan or red. His coat only needs to be brushed occasionally. The Miniature Pinscher is sometimes called the "King of Toys." He hails from Germany, and was popular there and in the Scandinavian countries during the 19th century. He is not a miniature Doberman Pinscher, instead being descended from a cross between a Dachshund and an Italian Greyhound. He was bred by farmers to keep rats out of their stables; "pinscher" means "biter" in German. 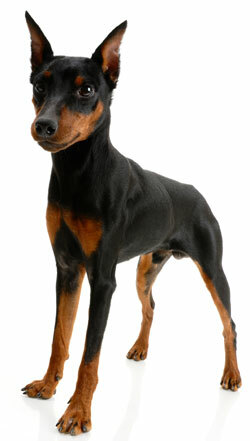 IN 1895 the first German Pinscher Club was formed, and in 1929 the Miniature Pinscher Club of America was founded. He was registered as a Pinscher (Toy) with the AKC in 1925, and his named changed to Miniature Pinscher in 1972. His AKC popularity was 26th out of 157 breeds in 2007.